plat•form – (1) a usually raised horizontal flat surface; (2) a device or structure incorporating or providing a platform; (3) a vehicle used for a particular activity or purpose or to carry a usually specified kind of equipment. for•mu•la – (1) a general fact, rule, or principle expressed in usually mathematical symbols; (2) a symbolic expression of the chemical composition or constitution of a substance. Gingko Audio’s Platformula™ technology gives users a basic set of elements with which to build a vibration control system for a variety of special applications. These design elements, selected for their vibration control properties, include two layers of horizontal plates and vibration control balls sandwiched between the plates. The resultant platform dampens and eliminates vibrations four ways: Vertically, horizontally, diagonally, and rotationally. The first application of this technology is the high-fidelity audio field where vibrations of all types (mechanical, electrical, electro-mechanical, etc.) can have significant effects on the performance of the component. Minimize the effect of any vibration present in the environment on the component. Minimize the effect of its own vibration characteristics on the component. Allow users to experiment with various configurations to achieve sonic performance according to personal preferences. For audio applications, Gingko Audio’s Platformula™ technology has been implemented with the following elements: An acrylic base plate with multiple wells (circular depressions in its top surface) capable of holding spherical vibration control elements; a number of rubber balls placed into the wells; a flat, skirted acrylic top plate resting on the balls. An audio component set on the top plate can move vertically, horizontally, and rotationally with respect to the vibration control elements and the base plate. The acrylate polymer of the plates effectively dissipates the vibration energy propagating through its material structure. The sets of rubber balls can vary in size and composition. They absorb most of the vibrations and isolate the base from the top plate. Together, this system isolates the audio component resting on the top plate from movement of the base up and down, front to back, side to side, and rotationally. For equipment with uneven load such as amplifiers or turntables, a user can position the rubber balls in the base wells to level the equipment and even the load, simultaneously achieving different sonic results to suit his or her taste. A Platformula™ enabled vibration control system can also reduce the noise level at the electrical output of the audio component caused by the vibration. This is shown in the next three figures. Figure 1-1 shows the vibration levels of a component sitting on and off the vibration control platform when external vibration frequencies from 10 Hz to 500Hz are applied to the base of the platform. Figure 1-2 shows the electrical noise level measured at the output of a tube preamp sitting on and off the platform as a function of the same external vibration frequencies. 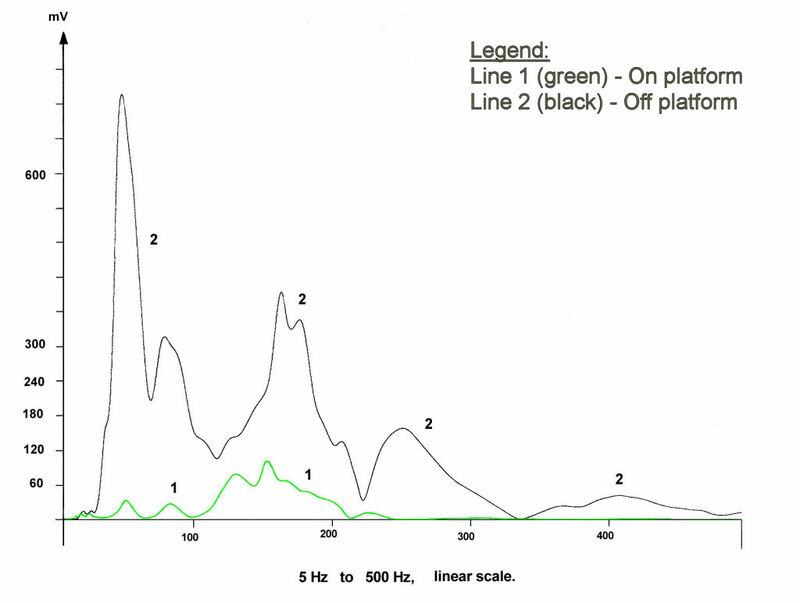 The reduction in vibration and noise level in the 10Hz to 1000Hz frequency range is significant enough to be readily recognizable in a listening test of a high-resolution audio system. (Note: We find in our experiments that any effects outside of this frequency range are insignificant by comparison.) The end result is higher fidelity reproduction of the audio source when the platform is used. Gingko Audio’s Platformula™ technology yields different sonic results when implemented with different materials, for instance, when different types of wood are used instead of acrylic. Different types and/or sizes of balls can result in significant variations in the sound reproduced. Figure 1-3 shows test results of vibrations on the same platform using two different types of rubber balls. We can also demonstrate in vibration test experiments that, depending on the choice of rubber balls and/or positioning of the balls, the resonance frequency of the platform itself can be reduced to less than 10 Hz, thus minimizing the negative effect it can have on the supported audio component. 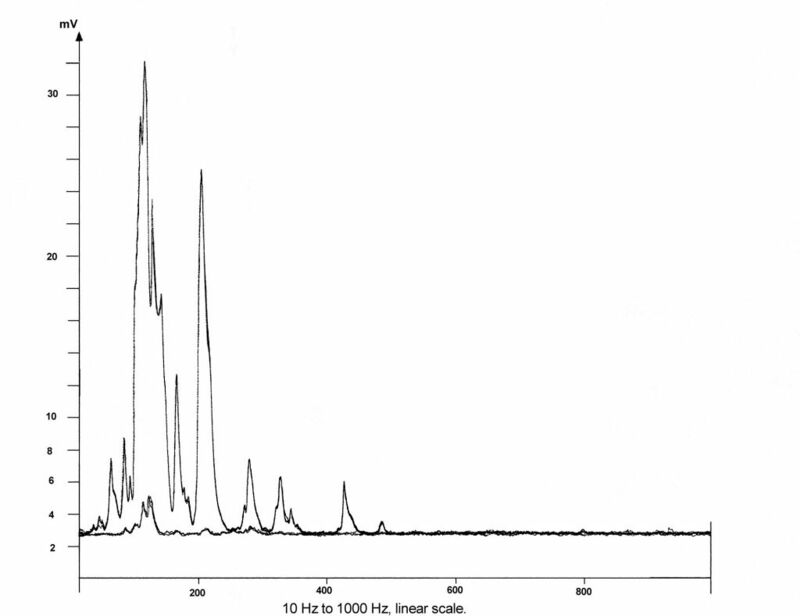 Overall, the damping effects of dissimilar materials differ significantly and, depending on the user’s audio system, can produce recognizable differences in sound quality in a listening test. The standard rubber balls that are included with each Cloud product yielded the best overall performance in the vibration tests we conducted. In addition, we found that adding more balls to the Cloud suspension, which results in a stiffer suspension, adds more dynamics and punch to the music. Conversely, removing balls, which results in a softer suspension, makes the music sound fuller and richer. The user can not only experiment with the number of balls but also with the positions of the balls to balance the load and achieve the musical result they prefer.